Babies are very delicate and sensitive, which is why everything about them must be handled with care. They also go through several developmental stages, especially in their first months and years. One of the stages that a baby goes through is the teething stage, and once your baby’s first tooth comes out, you need to prepare and make sure that you care for her teeth and delicate gums. As a parent, you have the responsibility of teaching your child good dental care habits at an early age. As soon as your baby grows her first set of teeth, you must ensure that you brush her teeth for her, and once she becomes capable, you must teach her how to brush her teeth properly. Our teeth serve multiple purposes. Aside from the fact that we need them to chew food, our teeth also have an important role in our speech. That is why caring for the teeth is a must, and proper caring starts with brushing. In order to brush your child’s teeth appropriately, you need to have the right tool. So, I present you with our list of the best toothbrush for babies that you might want to consider for your child. 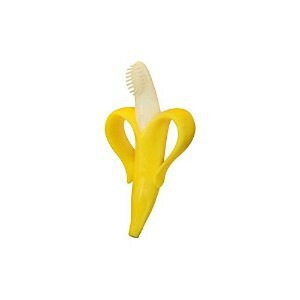 I am going bananas over this toothbrush and teether in one because of its unique and fun design. The cute banana shape and its soft texture are a great combination, which makes it a winner. It will definitely make brushing an enjoyable experience for babies from 3 months up to 1 year old. The Baby Banana Infant Training Toothbrush and Teether was invented by a registered dental hygienist who is also a mom, so she knows what she is doing. As such, it can be considered the ideal training toothbrush for infants whose teeth are beginning to come out. While most babies usually have their first tooth at six months, the Baby Banana can be used by babies as young as 3 months old. Since it is designed for babies, it is great to know that it is made of the highest-quality food-grade silicone. It is also compliant with government standards, so parents can feel at ease when they use this product on their precious little ones. The materials used are free from Bisphenol A or BPA, phthalate, latex, and other harmful toxins. Compared to other traditional toothbrushes for babies, the Baby Banana is much safer because of its unique flexibility. It decreases the risk of mouth injury because of its form and soft texture. The handles, which are banana peels, make it easier for babies to hold and learn how to work the toothbrush in their mouth. Aside from being a toothbrush, it also functions as a teether. Put it in the freezer for a few minutes, and once cold, allow your baby to chew and gnaw on it to help soothe her sore gums. The durable massaging bristles can also make your baby’s gums feel better. The shape is just right, and it is just big enough not to be considered a choking hazard, but supervision is still recommended. It can be cleaned in the dishwasher, but make sure that you also sanitize it before allowing your baby to play with it. To prevent it from dropping on the floor, you can thread a binky strap through the loops in the banana peel on each side. What's Great About It: I think that babies will like the Baby Banana because of how it looks. 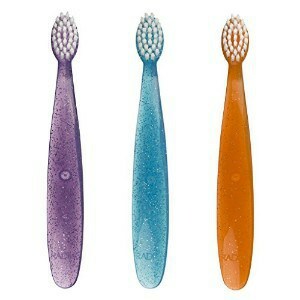 The bright color and the unique design make it stand out from other toothbrushes and teethers. Throw in the fact that it is dual-purpose, and this product surely sells. Babies and toddlers love things that are colorful and sparkly. So, a great way to get their attention and make them like brushing their teeth is to make them use a toothbrush that is fun, vibrant, and sparkly. The Totz toothbrush by Radius is one of my top picks because of its great features. It is specially designed for small teeth and gums, so the little ones will not be hurt while brushing their teeth. The brush head is perfectly sized, has a smooth finish, and is oval-shaped to ensure that it will not cause any harm to your baby’s sensitive teeth and delicate gums. It is an effective way to teach them how to take control of their own oral health as early as possible. One of the most important factors to consider when choosing things for babies and toddlers is the element of safety. Totz is guaranteed safe, as it is approved by the FDA. Parents can be at peace knowing that there are no harmful chemicals in the making of a Totz toothbrush. It is free from BPA, latex, and phthalate. In fact, the handles of Totz toothbrushes are made from virgin polypropylene, which is strong, light, and perfectly safe for babies and children of all ages. The bristles are made from vegetable-based nylon that is shipped all the way from Europe. The bristles are also guaranteed to be free from any harmful dyes. More importantly, Totz is easy for small hands to grip so your little one will not feel awkward using it. For parents whose babies cannot brush on their own yet, the toothbrush also fits an adult hand perfectly. What's Great About It: I love this toothbrush because of its 100% vegetable-based bristles which are made from castor beans. Unlike other products, which use plastic and other materials that eventually turn to toxic wastes, Radius did a wonderful job of using bioplastic handles that are better for the environment. They require fewer fossil fuels and less energy to produce and are mostly biodegradable. 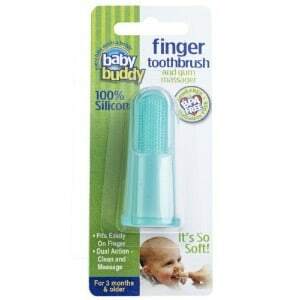 The Baby Buddy Finger Toothbrush is part of Baby Buddy’s oral care program, consisting of six different stages and the appropriate products for each stage. The products depend on the baby’s age, but this particular product is best for babies who are three months and older. Finger toothbrushes are recommended by dentists to clean, massage, and soothe delicate and tender gums of babies who are beginning to show signs of teething. The Baby Buddy is a great choice because it has a brush on one side and massaging bumps on the other for effective gum massage. It is safe to be used by babies because it is made from food-grade silicone. It is also BPA free, lead free, and phthalate free, so it is approved by the FDA. I like this product because it encourages parent and child bonding while also promoting oral health and hygiene. As it is meant to be worn over the mom’s or dad’s) finger, babies can chew on them without causing any discomfort. It softly cleans the gums, and teeth if there are any. The Stage 2 of Baby Buddy’s oral care program ensures that you can help eliminate harmful bacteria and sugar build-up in your baby’s mouth. As a result, your baby can have a cleaner and more hygienic mouth, tongue, and gums. It is very convenient as well as it can be taken with you anywhere you go so that your baby can have a clean mouth anytime, anywhere. It is also dishwasher safe so you can clean it conveniently. The only downside is that it may not fit fingers which are on the larger side. That is why it is used mostly by moms with smaller fingers and seldom by dads who usually have big fingers. What's Great About It: Fortunately, the material helps protect parents’ fingers when the little one decides to take a playful bite. The Mom Miya Baby Toothbrush is similar to the Baby Buddy that I discussed previously. It is also a finger toothbrush that is meant to be worn on an adult’s finger and used to clean a baby’s mouth as early as 3 months old. A finger toothbrush can be very helpful once your baby starts to grow his first tooth. When that happens, your baby’s delicate gums will be itchy and sore. You can help soothe your baby’s gums by using the knobby points of this baby toothbrush for massaging, which can somehow make him feel more comfortable. It is also BPA-free, which makes it safe for babies. I know that parents only want the best and safest products for their babies. The Mom Miya finger toothbrush has soft bristles, which allows you to safely clean your baby’s mouth and tongue, removing any traces of milk, which may cause cavities in the long run. What's Great About It: It comes with a case so you can put one in your baby bag or diaper bag. That way, you can keep your baby’s mouth clean and hygienic anywhere you go. I love the oral care products of MAM because their products are developed with consultation and advice from pediatric dentists. Since they are the experts in the field, you can be assured that MAM products help ensure effective development and lasting oral hygiene habits as early as possible. 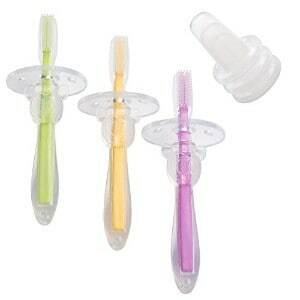 The Learn to Brush set is a great choice for babies who are 6 months and older. It includes a training brush, a first brush, and a safety shield. The training brush allows parent and baby to brush together because of its longer handle, so that you can also teach your baby the proper brushing technique. The first brush is perfect for babies who can already brush their teeth on their own. It has a shorter and more compact handle so it comfortably fits babies’ small hands. Both the training brush and the first brush have soft and rounded bristles which can easily clean plaque and bacteria. They also feature a toothpaste indicator to show how much toothpaste is recommended to be used. What's Great About It: I love the inclusion of the safety shield to ensure that the brushes will be kept at a safe distance from the back of your baby’s mouth. That will prevent the toothbrush from hitting any spot in the mouth or throat which might cause gagging. I also like that the bottom of the handle can be used to massage sensitive gums and to clean the tongue. It is important that your baby gets used to having her teeth cleaned that is why you should start early. As soon as the first tooth emerges, you can start cleaning her teeth twice a day. Some parents even start massaging their little ones’ gums with soft or silicone toothbrushes once they show signs of teething. Most babies get their first tooth when they are about six months old, but then again, it varies. Safe to say, between six months to 30 months, your baby will probably have all her 20 milk teeth out. Some parents prefer using a piece of clean gauze or muslin to clean their baby’s teeth. It allows more control, especially when the baby is just a few months old. However, it is always best to use a toothbrush specially designed for babies. Brush your baby’s teeth once in the morning, perhaps when you give her a bath so that it will fall within your daily routine. The second time should be before you put her to bed. Make sure that you do it after your baby has finished eating dinner and drinking milk. How you clean your baby’s teeth will depend on what is comfortable for both of you. You can try sitting your baby on your lap, facing away from you, because this position allows you to reach her teeth more easily. This position generally works best for babies, or even toddlers. You must brush with small, circular movements, but be very gentle because babies' gums are very sensitive, especially when they are teething. Carefully concentrate and focus more on the area where the teeth and gums meet. Teach your baby to spit out the excess toothpaste that is left in her mouth, but do not rinse her mouth with water. The residue from the toothpaste actually makes it even more effective in protecting your baby’s teeth. Of course, it is not enough that you choose the best toothbrush. You also have to make sure that you use a toothpaste that is suitable for your baby. The toothpaste should be specifically made for babies and should contain fluoride, which helps prevent tooth decay. If your baby is younger than 3, choose a toothpaste that has a lower fluoride content, but still make sure that it contains at least 1,000 parts per million of fluoride. 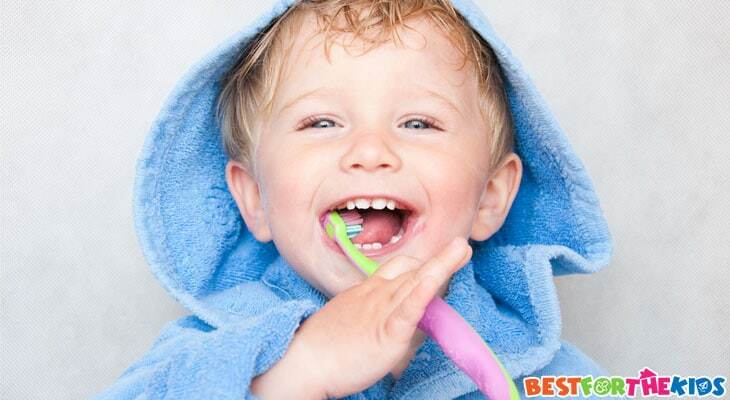 Do not allow your child to use toothpaste made for adults, at least until he is 3 years old. While some toothbrushes have a toothpaste indicator, most do not have one. Do not put any more than a smear of toothpaste on your baby’s toothbrush. A thin film that covers at least three quarters of the surface should be enough. Encourage and teach your baby to spit out excess toothpaste. It might take a while, but be patient in teaching your baby good oral care habits that he can take with him until he grows up. Lastly, it might be a good idea to refrain from buying toothpaste that has a fruity flavor to prevent your baby from eating or licking it. While swallowing small amounts is okay, large amounts of fluoride can damage your baby’s teeth and can even cause diarrhea and other related sicknesses. Aside from proper oral care, there are other things that you can do to protect and care for your baby’s teeth. It is common knowledge that the main cause of tooth decay is sugar. So, each time your baby eats or drinks something sweet, the sugar breaks down the mineral surface of his teeth. If you allow your baby to eat sweets regularly throughout the day, his teeth will not be able to repair themselves. What you can do is only offer sugary foods during meal times so that there will be several hours in between. If possible, it would be better if you could totally avoid offering food and drinks that have high sugar content. Instead, offer savory foods, such as cheese, plain crackers, or better yet, vegetables. Most kids, and even grown-ups, are scared of going to the dentist for a variety of reasons. However, as early as you can, make sure that you introduce your baby to the dentist so that he will be familiar and will not be scared of seeing a dentist when the time comes. You can take your baby along with you when you visit your dentist for an appointment. That is the first step of introducing him to the dentist and letting him understand the idea of dental checkups. When you take him with you to the dental clinic, he will be familiar with the sounds, sights, and the overall feel of the surroundings. However, if you yourself are anxious about seeing a dentist, taking him with you on your appointment might not be a good idea after all. Children can pick up on your fear, and that is the last thing that you would want to happen. What you can do instead is to schedule a separate appointment for your baby. When it comes to babies, safety should be the number one priority. Choose a product that does not have any harsh elements. Check if it is BPA/BPS-free, phthalate-free, and latex-free. Make sure that there are no detachable parts that could be a choking hazard for babies. The size of the toothbrush head should be small enough to comfortably fit inside your baby’s mouth. Aside from that, it should be of the right size so that it can easily access all surfaces of your baby’s teeth and reach small spaces inside the mouth. A toothbrush with a large head can hurt your baby’s mouth, and may even be difficult to maneuver. The texture of the bristles is very important because your baby’s teeth and gums are soft and delicate. If your baby remembers a bad brushing experience, he might not want to brush his teeth again, and it will be more difficult to deal with that. Give him a nice experience, and he will look forward to brushing his teeth every time, leading to good brushing habits. If your baby likes his toothbrush, it will be easier for you to instill good oral hygiene in him. It can be difficult to always have to exert extra effort just to convince him to brush his teeth, and that alone can be tiring. If he likes his toothbrush, though, no convincing is needed. Practicing good oral hygiene should not be underestimated, even for babies as young as 3 months old. As early as then, you can begin to teach your baby a sense of responsibility by brushing for him first, and then letting him brush his teeth on his own, with your guidance, when he is capable. Choosing the best toothbrush is equally important because that is your tool in making sure that your baby always has clean teeth, tongue, and mouth. A great toothbrush can define your baby’s experience in brushing his teeth, so you have to make sure that you choose one that he can use safely and comfortably. Your baby’s toothbrush should be safe, should be the right size, should have soft bristles, and should be liked and love by your little one. Hello Sandra! Thank you so much for featuring Baby Buddy as one of the best baby toothbrushes. We are honored to be part of this list. We offer not only baby toothbrushes, but an entire oral care line for babies and kids. Our other product lines offer organizational and personal care items for babies through those busy childhood years. If any of your readers have any questions, please feel free to contact us at [email protected]. I love your description of what it’s actually like to brush baby teeth right now. It’s really nice to know that it’s not just my kids who protest! They really just want to play with the toothbrush. Seriously, thanks for all this awesomeness!